Our small 2.2 hectare vineyard at the bottom of Weka Pass in the Waipara Valley was planted with Pinot Noir in 2003, with a tiny amount of Riesling added 4 years later. Our mission is to produce the best possible wines from this beautiful land in which we see so much potential. Our dream was made possible by our champion harness race horse “Under Cover Lover” who raced in New Zealand, Australia and United States from 1998-2000 and resides here with us on the property today. It was her success and huge financial contribution which enabled us to follow our passion for wine and her sheer determination keeps reminding us, to never give up on our dream. We engaged the services of the highly regarded blind winemaker CP Lin, the blind winemaking genius that took Mountford Estate to international fame. His lack of sight has helped him develop an incredible palate and sharpen all his other senses. This sensitivity shows through in his wines with his use of traditional wine making methods of no fining or filtration. 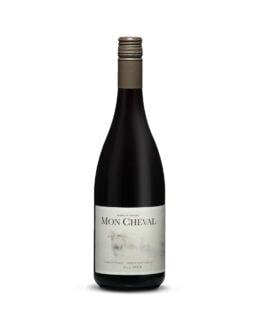 Mon Cheval Pinots are a wonderful southern hemisphere interpretation of the big Old World Burgundys. As one of the world’s rare blind winemakers C.P is forthright when refuting any notions that his handicap has influenced the way he makes his wines.